Near the end of every season, players of teams that have already clinched a playoff spot will often stress the importance of winning their remaining games to gain the home ice advantage, but how important is home ice advantage, really? Does it even exist? If so, how advantageous is it to be playing at home versus away? In the NHL, there are rules that specifically give an advantage to the home team. This, combined with other factors such as travel, home crowd energy, and familiar of the facility make up the “home ice advantage”. In this article, we will identify and analyze as many of these factors as we can. In a faceoff, the center from the visiting team must put his stick on the ice first. *We will not analyze whether having the choice of shooting first or second in a shootout affects the outcome of the shootout, because shootouts are not applicable in the playoffs. 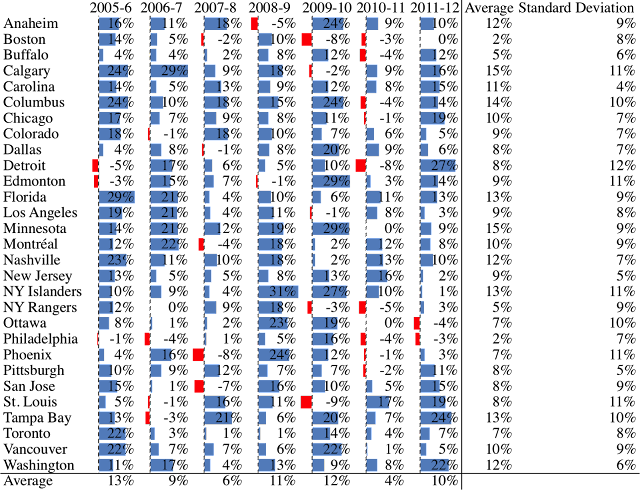 For each of these measurable factors, the difference between home and away games is observed and recorded to determine if they consistently correlate with wins. All measurements are taken from the regular season as it provides a much larger sample size. Although it seems counter intuitive, I decided to leave playoff games completely because a win in the playoffs is vastly different from a win in the regular season. A home team will have advantages over the away team, translating into a higher chance of winning. After analyzing the data, I found that during 203 team seasons(29 teams * 7 seasons), a team will gain a larger portion of its total points in the season at home. The average team in these 203 seasons earns 54.7% of its total points at home(point percentage difference is +9.3%). Such a small difference in performance at home and on the road might raise the question of whether the difference is truly from a home ice advantage or if it is just random variance. Out of 203 team seasons, I found that there has only been 29 times where a team has performed worse at home than away, and twice out of 203 team seasons where a team performed exactly the same, home and away, meaning that 86% of the time a team will have a better, or equal, home record than road record in a season. 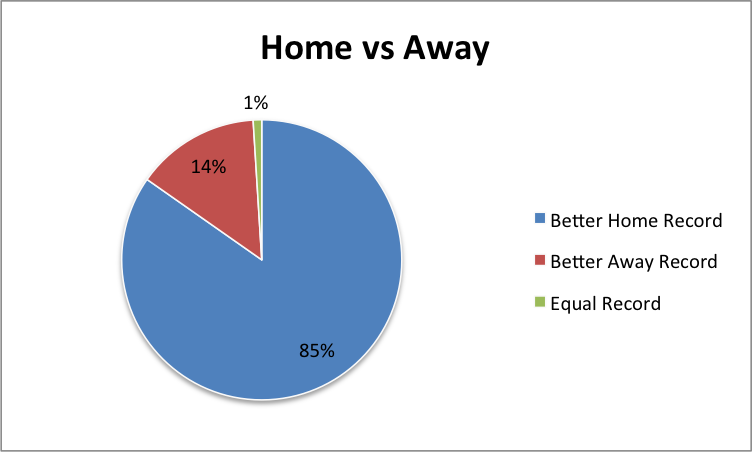 Although teams consistently perform better at home than away, the degree of the advantage is not very consistent. The average standard deviation(measurement of consistency in data) of each team over the span of 7 seasons is 8%. This could be due to the small sample size in each season, especially teams who are on the bottom of the standings as they have less points. 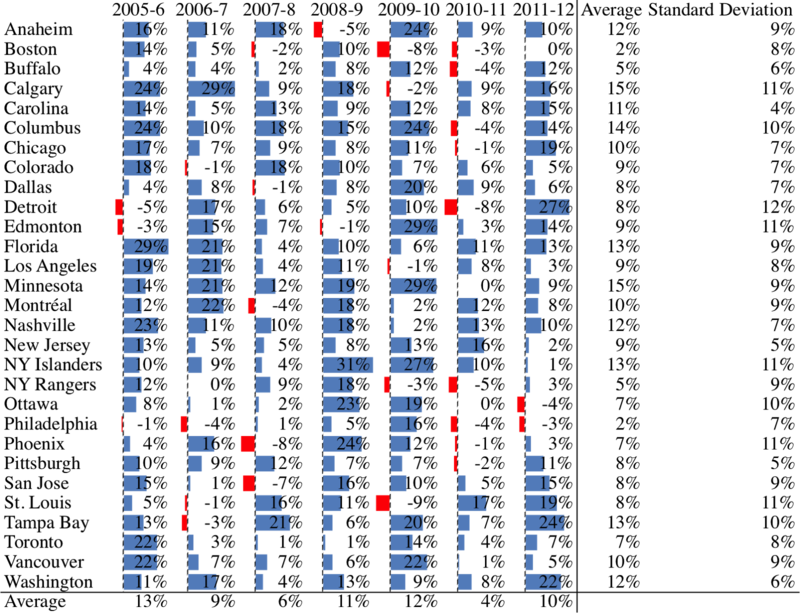 Recall that the point percentage is divided by total points, as total points decrease, significance in each point earned, home or away, increases. This could also be due to the different schedules in each season. If you have a lot of strong teams visit your arena, the point percentage difference of that season could be affected, and vice versa. A team have advantages playing at home over the away team, translating into a higher chance of winning. The average team will earn ~55% of its points at home. 86% of the teams between 2005-06 had a better, or equal, home record than road record. Although home ice advantage does exist, it is only a small advantage. Many other factors will affect the outcome of the game more significantly. The home team has an advantage on faceoffs by design, therefore, the home team will win a higher percentage of the faceoffs. To analyze this factor, the percentage of faceoffs won at home out of the team’s total faceoff in the 2012-2013 season is calculated. The shortened season is chosen because NHL.com does not have data on some of its games in the seasons prior, for unknown reasons. Examples include: this and this. The amount of faceoffs taken in the shortened season is a large enough sample size, 42896 to be exact, to be able to confirm or deny our claim. 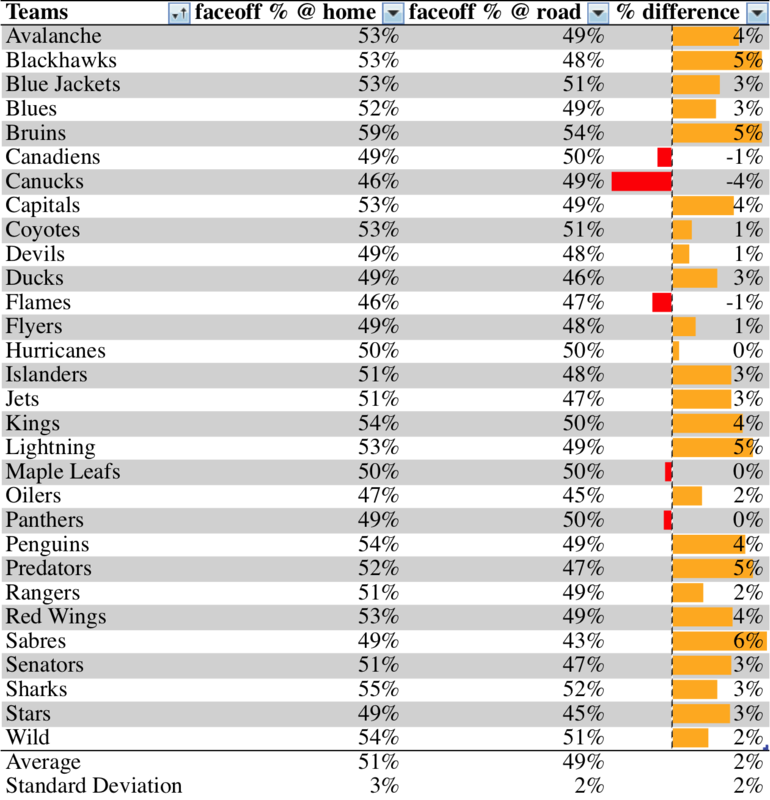 As you can see from the chart, the average NHL team in the 2012-13 season won 51% of its faceoffs at home, which barely seems like an advantage. This once again poses the question of random variance versus actual advantage. The answer, once again, is that the advantage does exist. In this season, only 3 teams had a worse faceoff percentage at home than away: Vancouver with a 4% difference, and Calgary and Canadiens with a 1% difference. 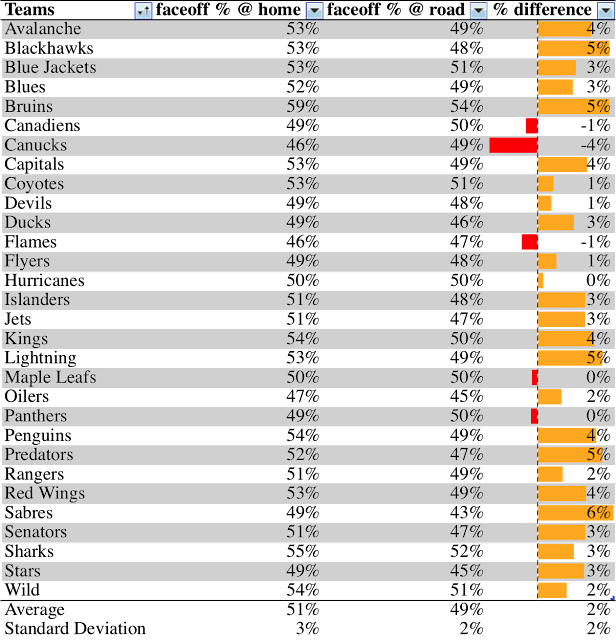 All other teams had either had a better faceoff percentage at home than away or performed equally in the faceoff dot. The average team will have a 51% winning percentage for faceoffs taken at home. 24 out of 30 teams had a better faceoff percentage at home than away.